I was really craving choux, the dough using to make cream puff pastry, this week, plus they are relatively quick (but not simple) to whip up. Simple was paramount this week – darned long algorithms homework! I prefer a custard filling in cream puffs, especially if you make it with vanilla bean. The flavour is really something special, if you can get your hands on it. 1. In a saucepan over medium-high heat, mix together the milk, water, butter and salt. Bring to a full boil. When the butter is melted, remove the pan from the heat, add all of the flour and stir with a wooden spoon until blended. This may require some powerful stirring. Return the pan to medium heat and continue to stir until the mixture forms a ball. Remove from the heat and let cool 3-4 mins, or to 140o on an instant-read thermometer. 2. Meanwhile, in a small bowl, whisk one of the eggs. Pour this into the cooled batter and beat with the spoon until it is incorporated. After the egg is added, the mixture will separate but it will come back to a smooth consistency after some beating. Repeat this process for the remaining 3 eggs. Let the paste cool for another 10 mins before piping it. 3. Preheat the oven to 425oF and line 2 half-sheet pans with parchment paper. Fit a pastry bag with a 5/16″ tip and fill with the paste. Pipe about 1 tbs of the paste onto a pan, forming a mound about 2″ in diameter Space the mounts at least 2″ apart so that they have room to puff. 4. Bake for 15 mins, then reduce heat to 375oF and continue to bake until the puffs turn golden brown, about 15 mins more. 5. Remove from the oven and immediately prick the side of each puff with a sharp knife. Reutrn to the oven, leave the door open and let the pastries dry for 10-15 mins. Move to a wire rack and allow to cool completely before filling. 1. Scrape the seeds out of the vanilla bean with the tip of a knife. In a saucepan over medium heat, heat the milk with the vanilla bean pod and scraped-out seeds until just before it boils. Remove from the heat and take out the vanilla bean pod. 2. In a separate bowl, whisk together the egg yolks, cornstarch and sugar until smooth. Slowly whisk the hot milk into this mixture until well-blended, then return the entire mixture back to the sauce pan. 3. Cook over medium-low heat, whisking constantly to prevent curdling or uneven cooking, until the mixture comes to a boil and thickens, about 3 mins. Continue to whisk and cook for about another minute. Pour through a fine-mesh sieve unito a clean bowl and stir in the butter until it is melted and smooth. 4. Cover the bowl with plastic wrap to prevent a skin from forming and refrigerate until well chilled. 5. Fit a pasty bag with a small tip and fill the back with the chilled creme patissiere. 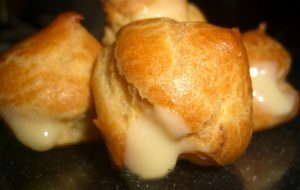 Make a small incision in a puff and fill with the cream. Repeat until all puffs are complete.